﻿ Chicago Hispanic Newspaper, Lawndale News, Hispanic Bilingual Newspapers, Su Noticiero Bilingue » Women Demand Respect! April 26, 2019 4:37 am You are here:Home Local News Women Demand Respect! Posted by Editor on October 27, 2016 in Local News | Comments Off on Women Demand Respect! 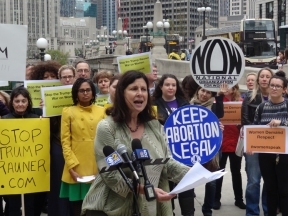 (1) Joined by nearly 100 activists, Jane Ramsey of Chicago Women Take Action starts off the speak-out at Trump Tower with a powerful message denouncing Trump and the GOP’s anti-women agenda. 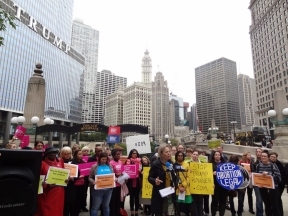 (2) Kathy Doherty, Executive Director of Chicago Metropolitan Battered Women’s Network, speaks out in front of Trump Tower alongside nearly 100 fellow activists from wide range of backgrounds.